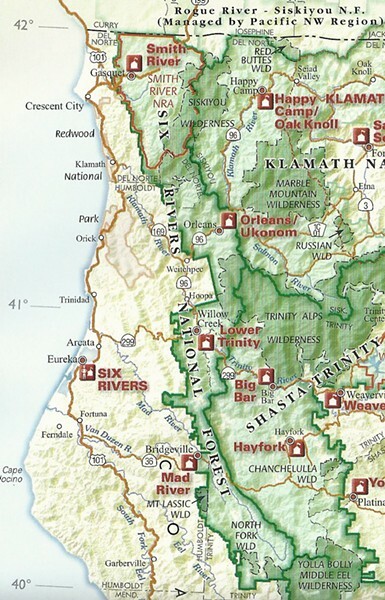 Extending from the Oregon border to Mendocino County, Six Rivers National Forest borders Klamath and Shasta-Trinity National Forests to the east and Mendocino National Forest to the south. Bret Harte (1800s Union -- now Arcata -- newspaperman before his success as a novelist and poet). Jed Smith (early explorer, hence Jedediah Smith Redwoods State Park). Starr King (California minister and politician, "the orator who saved the nation" by persuading California lawmakers not to secede during the Civil War). Yurok (dropped because the tribe's homeland lay outside of the new forest). Gregg (Dr. Josiah Gregg, along with L.K. Wood and six others, rediscovered Humboldt Bay in 1849). Ehrenberg (Cartographer Hermann Ehrenberg "discovered" the mouth of the Klamath in 1848). Silcox (Ferdinand Augustus Silcox, Forest Service chief forester 1933-39). Redwood or Redwood Empire (rejected because of the lack of significant redwood stands within park boundaries). Klamath (15,751 square mile watershed basin, 263 miles long.) Rising in Oregon, it's the only one of the six that flows from out of state. Efforts are under way to remove four of the upstream dams (Field Notes, 1/15/09). Trinity (2,853 sq. mi., 165 m.) Tributary to the Klamath, meeting it at Weitchpec. The Hupa people called the river the Hoopah. South Fork Trinity is the longest free-flowing river in California. Eel (3,684 sq. mi., 200 m.) Named for the lampreys that Josiah Gregg received in a trade with local Wiyot Indians, mistaking them for eels. Van Duzen (429 sq. mi., 63 mi.) Named by Josiah Gregg, the Van Duzen is tributary to the Eel, meeting it downstream of Rio Dell near Scotia Bluffs. Smith (719 sq. mi., 25 m.) Named for Jedediah Smith, it is a dam-free river. Mad (497 sq. mi., 113 m.) The Mad flows freely for 85 percent of its length, until it reaches Ruth Lake/Matthews dam. The name stems from Josiah Gregg's argument with the rest of his party at the mouth of the river (Field Notes, 3/12/09). It's the only one of the six not designated a National Wild and Scenic River. Barry Evans (barryevans9@yahoo.com) thanks historian Pamela Conners for her book, A History of the Six Rivers National Forest (USDA Forest Service, 1998).